The Grammy nominations are upon us, and it’s time to get all worked up about gold hardware again! Music’s biggest night will announce its contenders for the 2019 show later this week, but before we get into our best guesses for what to expect, some housekeeping: The noms will now air on CBS and Apple Music on Friday at 8:30 a.m. ET, delayed from its original Wednesday date due to George H.W. Bush’s memorial services. As is always the case, not every album or song from this year will be considered; only music released between October 1, 2017 and September 30, 2018 is eligible. And, lastly, the Recording Academy has completely upended the rules for its biggest categories so women won’t have to “step up” to get a nom … supposedly. Will the 2019 Grammys, airing February 10, be another sausage fest? Let’s place our bets. There’ll be so many more nominees this year. The Grammys aren’t adding any new categories to the already crowded list next year, unlike some other awards shows we know. Instead, they’re just adding way more nominees for the most coveted awards. 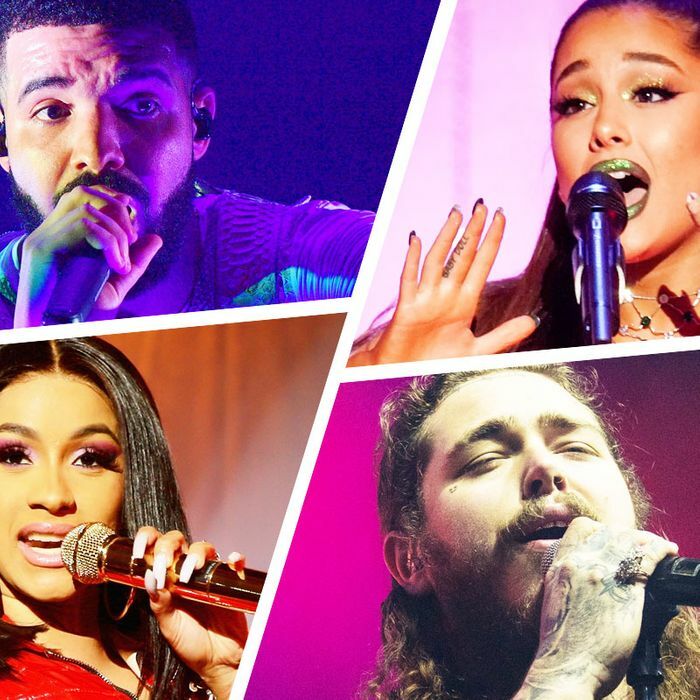 Starting with the 2019 Grammys, the big four categories — Album of the Year, Song of the Year, Record of the Year, Best New Artist — will increase from five to eight nominees each. Which means it just got way easier to get nominated for the fancy prizes … but way way way way way way way way harder to actually win one. It’s the thought that counts right? In theory, expanding the top non-genre-specific categories should make room for more diversity among various types of music. In reality, it’ll likely still be mostly a mixed bag of pop and rap and one very key country exception. Expect to see Album of the Year noms for Kacey Musgraves, Janelle Monáe, Drake, Cardi B, Ariana Grande, The Carters, and maybe Sam Smith. How the rest of the pool shakes out could either get random, boring, or both. Maybe Post Malone makes it through? Kendrick Lamar, a longtime Grammy favorite, could see his acclaimed Black Panther soundtrack in the mix. (Never forget O Brother, Where Art Thou? won AOTY). As could the hugely successful Greatest Showman OST; Pasek and Paul do already have Grammy hardware for their theater work. The good news for everyone is there’s no real favorite or big showdown this year unlike previous years (remember Beyoncé vs. Adele) so AOTY is practically anyone’s for the taking. Taylor Swift’s reign might be over. In years past, a surefire nod would’ve been reserved for Taylor Swift’s Reputation in Album of the Year (it missed the deadline for eligibility at the 2018 Grammys). She’s been nominated in the category three times and won it twice. But there’s a strong chance Swift could be the Ed Sheeran of next year. Despite being one of the biggest-selling albums of 2017, Divide was snubbed for AOTY at the 2018 Grammys and Sheeran only received two nominations, each in the lesser genre categories. Increasingly, it seems sales (and streaming numbers) are not the only selling point for the Grammys, which could spell trouble for Swift. Another bad sign? The Grammys snubbed Reputation’s lead single “Look What You Made Me Do” — which was eligible for the 2018 Grammys — entirely. Working in Swift’s favor, though, is the expanded nominee pool. Reputation could still get a courtesy nom when it would’ve otherwise been left out in previous years with less choice. Best New Artist is going to piss off everyone. It’s the category known to stir up the most controversy and that’s not likely to change next year. The 2018 Best New Artist results saw major backlash from those who felt Alessia Cara shouldn’t have been eligible for a 3-year-old album, meanwhile the rules for who’s allowed to make the cut are only getting odder. Post Malone has reportedly been voted ineligible for the nebulous reason that he’s already too popular and it would be unfair to the rest of the nominees, despite him being technically eligible by all other criteria. (Another comical caveat: He’s been barred from competing in the rap field because his album doesn’t contain enough rapping; you’ll instead find him in pop.) A similar vote is said to have also ruled out Camila Cabello, who got famous first with Fifth Harmony. Meanwhile, Cardi B won’t be eligible because she was previously nominated in the rap category at this year’s show. And there are rumblings that XXXTentacion, Kane Brown, and Ella Mai might get booted on an outdated technicality counting them as over the maximum amount of songs released (30) to be considered for BNA. In X, and possibly Mai’s case, because of tracks not properly released, but still put out on streaming, before they were signed. So then who’s left? It’ll be slim pickings that ultimately end up with either pop stars Dua Lipa or Troye Sivan running away with the award, assuming they haven’t been ruled out for previous popularity either. Other guesses could be pop star Bebe Rexha, rapper Juice WRLD, cult fave band Greta Van Fleet (although their album isn’t eligible), country singer Luke Combs, rapper Lil Pump, or singer Jorja Smith. Some of the year’s biggest songs will be missing. The Grammys adhere to a strict eligibility rule that isn’t flexible even if a song released outside their date range technically blew up within that same eligibility timeframe. For that reason, Sheck Wes’s “Mo Bamba” and lovelytheband’s “Broken,” two slow burners released too early last year, will miss out. Ariana Grande’s “Thank U, Next” may very well go out as one of the biggest songs of 2018, but it passed the deadline by a couple months. HAAA AH AH AH AH, AAAH AAAH, AH AH AH AH HAAA. Drake has a good problem. 2018 was the biggest of Drake’s career yet: He had three (!) songs interchangeably sit at No. 1 on the chart for most of the year. But that fact alone might also mean he’s competing against himself. It’s not necessarily impossible for Drake to be nominated multiple times in the same category, but it hasn’t been common for the Grammys to do that. In that case, Grammy voters might’ve been split between “God’s Plan,” “Nice for What,” and “In My Feelings” and perhaps he’ll get shut out completely in the top song categories. (It’s worth noting that Drake has never been nommed for SOTY or ROTY as a solo artist; he also didn’t submit last year’s More Life, but tends to do so for proper albums even when he’s a no-show.) Or, more likely, they’ll pick a favorite: The best guess for that would be “God’s Plan,” which reportedly just became his first single to go diamond, a rare feat. The Grammys tend to care about such things. And while there’s a whole separate awards show for the Billboard charts, their popularity metrics do play a role in the Grammys’ decision making. Meaning that in a year overwhelmingly dominated by rap — hip-hop led the Hot 100 for the most weeks in the chart’s history — it’s likelier than ever that a rap song could win its first ROTY or SOTY, and there’s a good chance said rapper is Drake. Kanye could show up beyond just rap. Kanye is one of the winningest artists in Grammy history with 21 awards and 68 noms, almost exclusively in the rap categories. Kanye has famously never won Album of the Year and hasn’t picked up an award since 2013, fueling an often contentious relationship between him and the show. (He’s even skipped and boycotted it the last few years.) This year, Kanye has a new Grammys strategy: go big or go home (where he’ll probably still be on Grammy night regardless). Kanye has always been a producer first — in fact, all of his AOTY wins are for his production on other peoples’ albums — and this year he worked overdrive behind-the-scenes. Kanye produced three Kanye albums (two solo — though who knows when Yandhi will be released — and one with Kid Cudi); albums by Nas, Teyana Taylor, and Pusha T; and singles by Christina Aguilera, Lil Pump, and Migos. And almost all of that work was released in the span of a month. For that reason, he’s submitted for Producer of the Year, a category he’s egregiously never been nominated for, where he might face off against Jack Antonoff. But that’s not all. Kanye wants it canon that he’s not bound to genre, submitting “Freeee (Ghost Town, Pt. 2)” with Kid Cudi for Best Rock Song and Best Rock Performance. If you think that’s crazy, recall that Beyoncé got a rock nom for “Don’t Hurt Yourself” just last year. (But not country, which is still rude.) Will the Grammys be able to do the impossible and overlook Kanye’s, uh, divisive year to still give him his flowers? If any award show would, it’s this one.